Hello ... Hello ... my old friends ... It's great to see you once again! 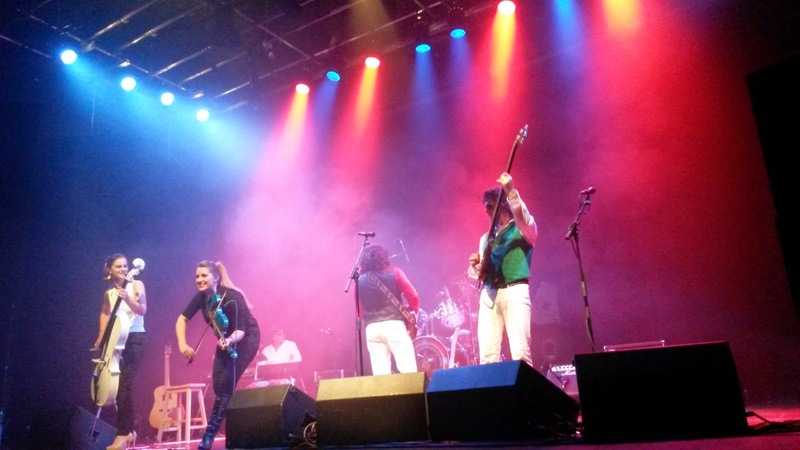 The thirty four  mile journey to see ELO Again at Ludlow Assembly Rooms in Shropshire last night [Saturday 4th October] was more than justified as the South Wales based septet delivered a truly electrifying performance. 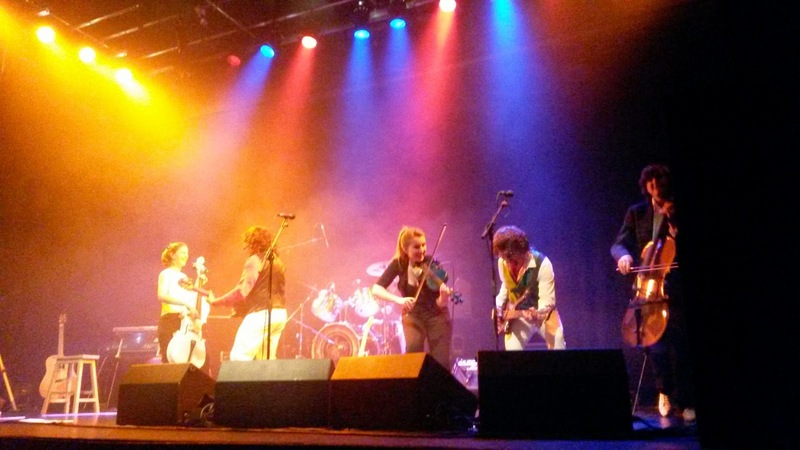 It had been nearly eleven  months since ELOBF had seen the band perform at The Robin 2 last November and this writer was keen to see the band again, especially after the overwhelming success of Jeff Lynne's appearance at Hyde Park last month. ELO Again really do give you a dramatic taste of what the classic ELO 'magnificent seven' were like on stage in their 1974-78 touring heyday. 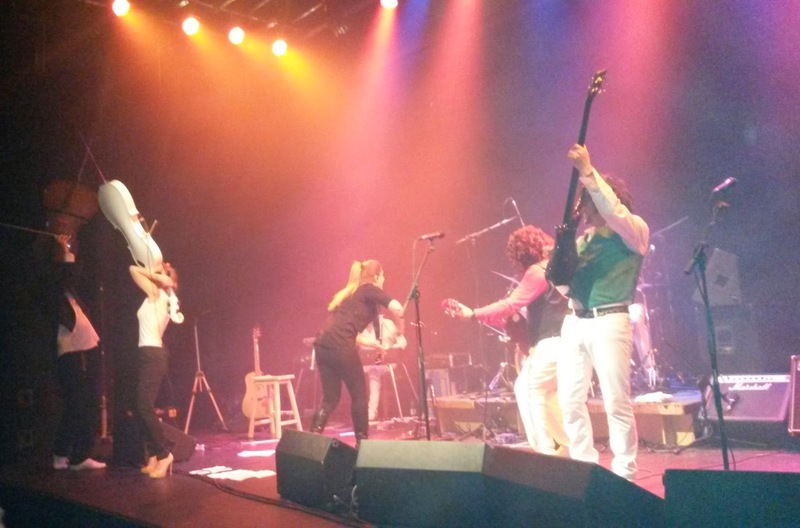 This was a very organic and enthusiastic show with the attention shared between the rhythm and string sections. What I like about this band is the prominent part played by violinist Gaelle Favre in all of the songs, ably supported by cellists Sarah Waycott and Sion Dafydd Dawson, the latter as energetic and eclectic as Hugh McDowell, including his personal off-stage tour of the auditorium whilst playing said cello! The ELO Again rhythm section - complete with a rather attractive range of wigs - led by the jovial Colin Smith [alias Jet Flynn] together with bassist Jim Ramsey, keyboard maestro Mike Holcombe [alias Rick Candy] and drummer Clive Smith [alias Bev Devon] kept the appreciative audience on their toes as they reproduced accurately those ELO songs we all know and love. This was an accomplished and professional performance. Choosing highlights from their twenty four  song set is difficult but I thought their covers of "Livin' Thing", "Showdown", "10538 Overture", "Can't Get It Out Of My Head", "Twilight", "All Over The World" and "Telephone Line" were excellent. Go see 'em folks! Set #1: [Intro: "Eldorado Finale" & "Sinfonia da Requiem, Op. 20"]: "Standin' In The Rain", "10538 Overture", "Evil Woman", "Big Wheels", "Livin' Thing", "Hold On Tight", "Wild West Hero", "Showdown", "Sweet Talkin' Woman", "All Over The World", "The Diary Of Horace Wimp"
Set #2: [Intro: "Prologue"]: "Twilight", "Confusion", "Can't Get It Out Of My Head", "Do Ya", "Shine A Little Love", [violin solo], "Last Train To London", "Telephone Line", "Rock 'n' Roll Is King", "Turn To Stone", "Rockaria", "Mr. Blue Sky", "Don't Bring Me Down", "Roll Over Beethoven"
ELO Beatles Forever [ELOBF] recommends: ELO Again to those enlightened folks who enjoy the music of ELO, Jeff Lynne, Roy Wood, Wizzard, The Move, The Idle Race, 'Brum Beat', The Beatles and related artistes. They do put on a good show, the string section make the band. However the lead singer lets the band down somewhat with his rather weak vocals. The ELO Experience have the better vocalist in Andy Louis. I've seen both bands and think the last comment is unjustified because ELO AGAIN are a completely live show and don't use any backing tracks unlike ELO experience. ELO AGAIN also have a much more energetic show. While both bands are good I have to say that ELO AGAIN are the band that I would go and see AGAIN and AGAIN and AGAIN. 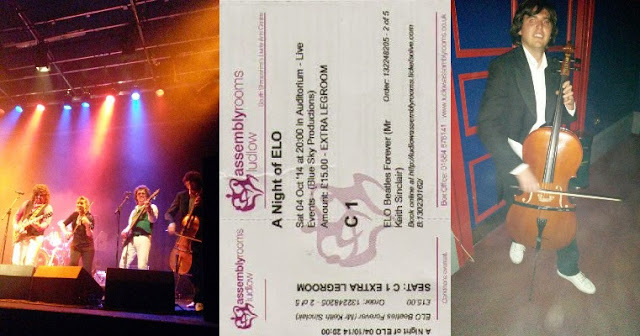 I have seen the very talented ELO Experience a few times and although the string section are present, all I can hear is the orchestral keyboard overpowering them so if you like synthesized strings and musicians who seem to play like they are on auto pilot go and see the ELO Experience. If on the other hand, like myself, you want to hear ELO music played brilliantly LIVE, with a string section whose on-stage antics are akin to the original ELO shows we as fans fell in love with back in the 70's, go and see ELO Again. They are great to listen to AND watch. Like I said the string section in ELO Again are very impressive and make the band but the lead vocals are weaker than the ELO Experience IMHO.